East Dunbartonshire Council’s Local Transport Strategy identifies the construction of the Kirkintilloch Link Road as a strategic infrastructure requirement for the redevelopment of land at Woodilee Hospital. The Consortium (Cala, Redrow, Miller & Persimmon) appointed DBA to prepare the outline design of the KLR and advise on Transport / Highway matters relating to the development masterplan. DBA’s studies included developing a strategic local area Trips model assessing the KLR’s diversion effects on the road network. 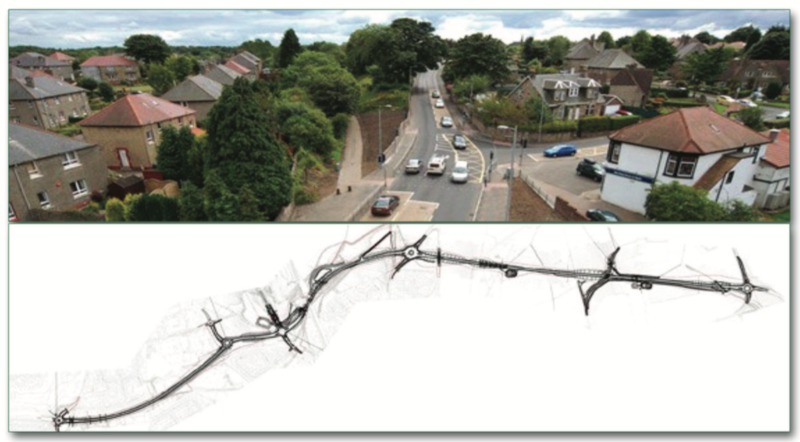 DBA prepared a Local Model Validation Report (LMVR) demonstrating that the Trips model accurately predicted traffic conditions within the Kirkin lloch & Lenzie conurbation. The validated model was updated using local growth factors and committed development to assess future demand and traffic assignments were produced for both the committed base and design networks (including the KLR). The KLR will Link Kirkintilloch to Scotland’s motorway network, running from the Town Centre to M80 Hornshill Interchange / Stepps by-pass, providing benefits to the local economy and improving the environment and public safety by diver ng heavy traffic away from residential areas.